The One Trick I Used to Grow my Clients Pinterest Traffic by 50%! These types of posts do amazingly well on Pinterest. That last post is one that I wrote – and it got me tons of new subscribers and is one of my top commented posts of all time. See that spike towards the end? I posted my case study on May 7th. As you can see, my email opt-ins practically doubled for the next few days… and I’m STILL seeing the spike. Case studies work. Because people love to see REAL results. When they’re working towards a goal, they like to see what other people are doing and how they’re doing it. There is proof element to it – people aren’t just taking your word, they believe you because you’re showing them how. Who doesn’t want real advice proven to help them reach their goals? These posts drive tons of traffic AND subscribers. 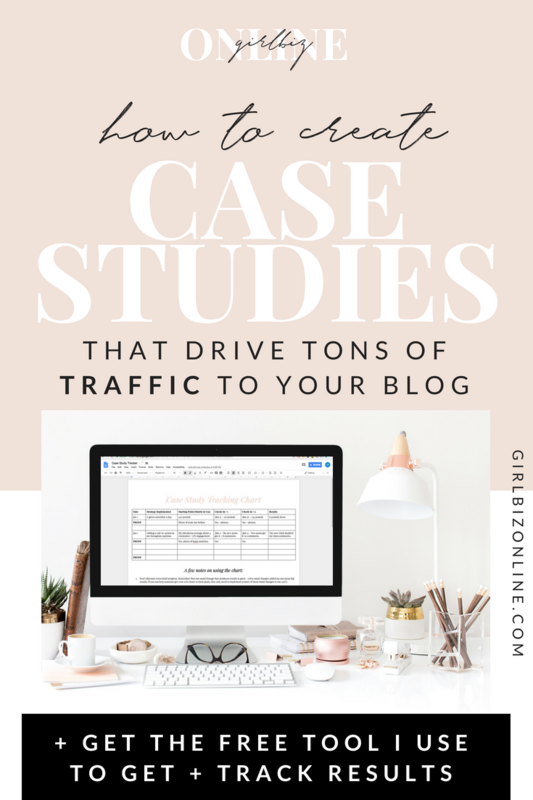 It’s a no brainer – you should definitely be incorporating case studies into your blogging strategy. But what if I have no amazing results to share? Don’t underestimate the small win. A jump in conversion on an pop-up from 10% to 20% is a BIG deal. An increase in Pinterest views for your client from 50k a month to 70k a month – it’s a big deal. Losing two pounds with a simple diet tweak? A big deal. Even those these might not seem like MAJOR jumps – they are still results. All of these small wins add up to really big wins when done together and done for a longer period of time. Even if your strategy only brings someone 10% closer to their goal – 9 more changes like this and they’ll be 100% closer. Don’t discount any small results. If you’re doing something that is working – share it with confidence. And I bet you do have great strategies and ideas – you’re probably just not tracking them. S T A R T T R A C K I N G ! Case studies are probably the type of blog post that generate THE MOST social traffic + social shares. Like I said before, people love seeing actual results. They get to take a short cut and skip right to the winning answer – figuring out what works and what doesn’t without the trial and error. That is so enticing – no matter the industry. If you want to guest post or be featured by a big blogger or brand, the best way to go about it is to implement their strategies and see results. Instead of asking to guest post or be featured on their site, imagine what it would look like if you reached out to them and showed them what their strategies did for you. If you have a great case study, it would be really hard for them to resist sharing it with their audience. Here is an example from Mariah Coz of Femtrepreneur. A few years ago, she implemented a strategy from a bigger blogger and shot them a nice email about it. 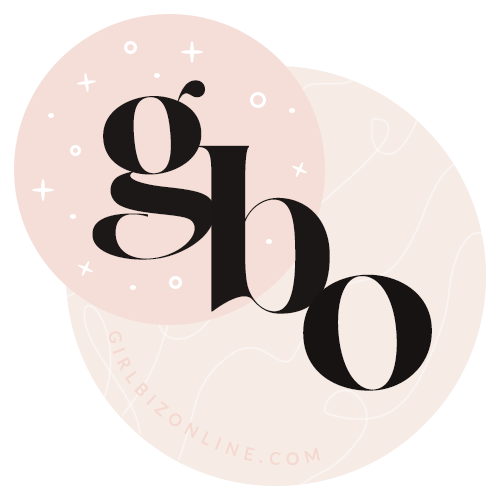 She wasn’t asking to speak about it or guest post – she was only telling them about her success and, at the end, she hints that she could be a case study if the blogger ever needed it. As you can see, the person is clearly interested. They offer to set up an interview. Who wouldn’t want a case study that shows how great their strategies are? This is a clear way to get free features by much bigger bloggers who wouldn’t be interested in promo for promo. Even if this doesn’t work for you (or you get results with your own strategies and there is no one to reach to) – you can use the case studies to prove your VALUE when you make a guest pitch to a podcast or blog. Podcast hosts are always looking for quality guests – make yourself that person by having PROOF that you’ll be bringing great content to the table. Bloggers might get lots of pitches – but yours will stand out if you have a great case study to share that would be valuable to their audience. There is no better way to sell your skills than case studies that prove your strategies WORK. Whether it’s a course, a service, or a product – people want to know that what they’re buying produces results. If you can show them a case study, it basically removes all objections. People will find the money if they believe a tool will truly help them. Plus if you’re heading into your first launch and you don’t yet have testimonials to back your product, your own case studies still give you that proof-piece that removes objections and leads to sales. Basically – think of a result someone visiting your blog would want to achieve. Whether it’s to lose weight, get more social media engagement, or feel more mindful and positive – what is their goal? Now what tips or strategies you can experiment with that might help them get there? For your first case study post, I would try to pick something that doesn’t take a long time to produce. Case studies don’t always need to be long and in-depth. You can implement one small change and see what happens within a matter of days. I actually prefer to see one change that makes a difference. It’s much easier to get started because ONE thing can be implemented quickly. Then your reader is more likely to do what you say, see results, and come back to you for advice. For example, if you’re a social media manager – try a few different Pinterest layouts for one pin. Check in a few days what got the most traffic. I only have ONE case study rule – there should always be an opt-in connected to it. Case studies are so powerful and, after seeing your results, your reader is primed to take action on your advice. Make sure there is a content upgrade so you can turn that reader into a subscriber and make the most of your traffic. 2. Record the date and strategy that you implemented as well as your starting point. The thing to know about a good case study – you basically need to document everything. Every step on the journey should be recorded with as many specifics as you can get. Photos are even better. You definitely need to understand your starting point – or you’ll never get a real idea of what the actual results from your change. So use the Tracker that I shared to mark the first day and the starting point. Again, get as specific as possible – exact numbers if you have them. The tracker also reminds you to get proof for each step – and make sure you do that, even for your starting point. There is nothing better or more convincing than a comparison showing the before + after. 3. Pick a schedule for tracking. If you make a commitment, you’re much more likely to actually follow up. Decide how often you’re going to check in for results and you stand a better chance of actually doing it. I put my check-in dates in the tracker ahead of time. This way I’ve already decided when to follow up and I’m much more likely to make it a priority. Like we were talking about before, tracking everything for proof is key. The whole point of case study posts is that they prove a result is possible because someone has done it. This piece is really important, especially if you want to use case studies for your launches or sales pages. The specific details and images could make or break a sale. 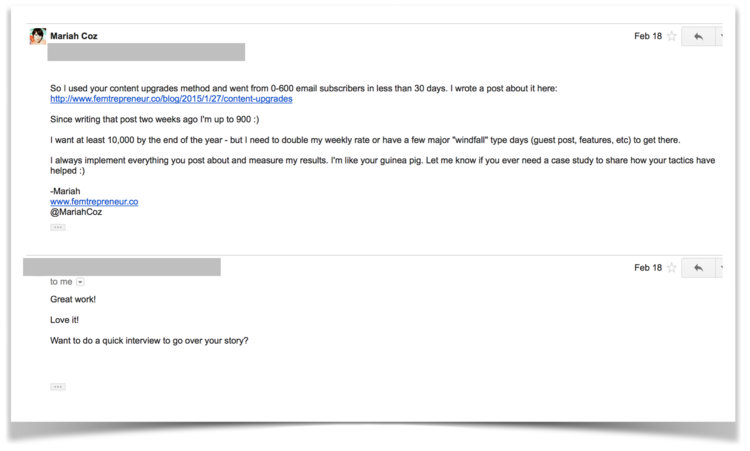 Remember the photo I showed you above – the screenshot of my email subscribers after posting my case study? I’m sure that grabbed your attention, increased the legitimacy of what I’m saying, AND enticed you to read on because you know that what I’m going to talk about can help you see those kinds of results too. That is a prime example of what a great case study does. If you cant get photos, use Canva or another program to create charts to show your results. Any visuals that back up what you’re saying will help get your point across. Below is an example chart that I made in Canva. 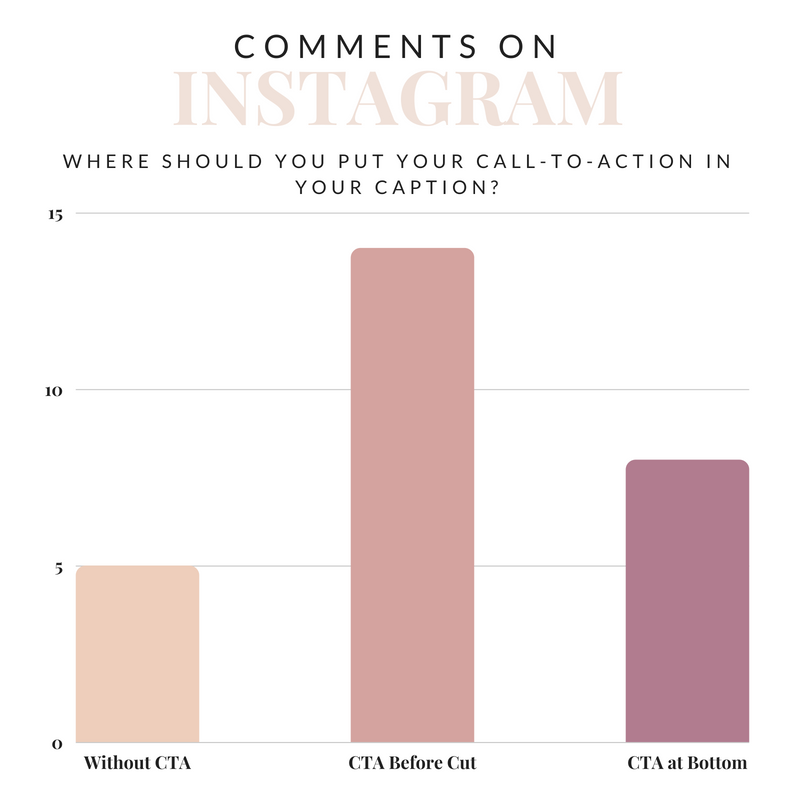 An example chart (not based on any real data) that I created in Canva – just to show you how easy it is to turn your strategies into proof. Photos are always best, but charts can help where photos aren’t available OR to just provide added value and increase belief with your reader. 5. Present it in the right way. Don’t be afraid to use a title that draws attention – just be able to back it up. This is why the proof piece is so important. You can only make a big claim if you have the images or documents to back it up. It just increases the legitimacy of what you’re sharing. Clearly include the end result in the title. Create a bit of mystery. But what if my strategies aren’t working? What if you start test and realize that what you tried – just didn’t work. Don’t be discouraged. That can be just as valuable to share with your audience as things that do. Negative results still make great case studies – break down what you did and explain why that strategy DIDN’T get results. Another thing I like to do is tweak and try again. I keep those negative results in my tracker, collect the proof, and then make a change to try to improve it. I start a new log in the tracker below the negative one and keep trying. If you start out with a negative or not-great result and manage to figure out what works, you have a valuable strategy to teach and share. It might even go beyond the case study – into a paid service or course. Developing strategies and tweaking them until they work – it can all take a long time. But it is so worth it if it helps your audience AND helps you make money from your biz. Most of us teach or show our audiences how to achieve something. There is nothing that builds trust or generates sales like proof that you can help them reach these goals. You just need to start testing and tracking. 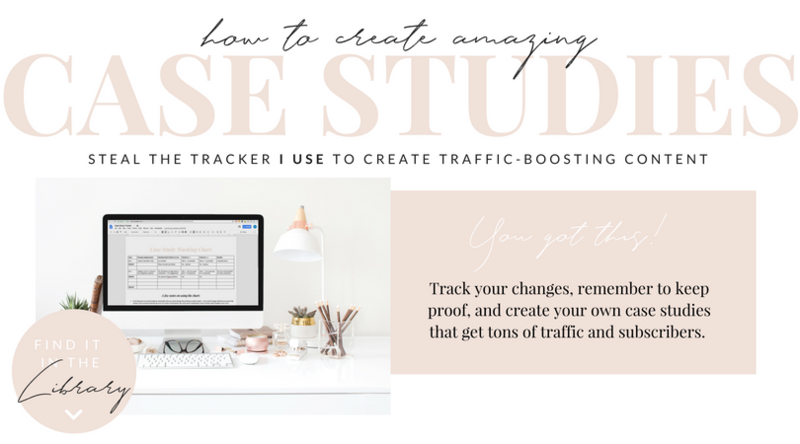 Steal the Case Study Tracker so you can start doing this for yourself. Once you see the kind of traffic and subscribers it generates, you’ll know it’s worth the effort. I’ll send you the link to your email and you can copy it for yourself! Best of luck with your case studies, girl bosses. I know you’ll kill it. If you have any questions, just pop them in the comments and I’ll be sure to respond! This is a great suggestion for content. Thank you! !